Mary Berge on a service project in the Dominican Republic. “Rotary service makes me happy,” she says. This applies strongly to Rotary membership. It’s far less interesting how you became a Rotarian than why you became, and why you remain, a Rotarian. I became a Rotarian because of my innate character to give. I am, by nature, altruistic and I believe in doing the right thing (even when no one is looking). In a nut shell, I feel good when I’m helping others. I remain in Rotary because I feel good when I’m helping others. I also remain in Rotary because of the connectedness I feel with my fellow Rotarians through service and fellowship. We are engaged in each other’s lives in and outside of our Rotary meetings. My fellow Rotarians really care about me and I really care about them. Outside of family, where else does that happen? Rotary has become my extended family and the fact that my family reaches around the world has a huge impact on me! 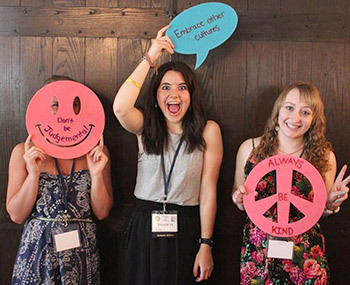 Youth Exchange students and Interactors use words that encourage peace during a district conference activity. I wonder what Rotary will look like in 2050. I wonder about how our journey, together as Rotarians, will take shape. I imagine the powerful and meaningful projects that will happen along the way. I imagine the positive impact we will have on human lives, all over the world. I imagine the lifelong friendships and bonds that will spontaneously occur as a result. It makes me smile to think about it all. Have you noticed the common theme in my words above? It’s happiness. I believe that Rotary makes people happy. The givers and receivers of our Rotary service are happy people! And when we are happy, we work, play, and love harder and better. Our performance, energy and creativity increases. In Rotary, the happier we are, the harder and better we serve others! Success doesn’t lead to happiness; happiness leads to success. Our goal in Rotary is to serve others and to do good in the world and by working toward and achieving these goals, alongside my fellow Rotarians, I am a happy person! This entry was posted in Developing leaders, Empowering youth and tagged Membership by Rotary International. Bookmark the permalink. I simply love this caption, it sounds like……..the more we are together, the happier we shall be. There is no doubt that to serve better, we must love better, laugh better and bond better. Therein lies the power to serve!! I love this immensely Ijeoma. It is amazing what people can do with love in their hearts. The God kind of love that passeth all understanding make us stands out above the rest. It is a strenght when we are collective so surely the more we are together the happier we must be. This is an inspirational message to all rotarians. Truly happiness bring successes in life. This is immensely true for me as well. As a Rotarian and a community development worker and a voice of the community, I see it as a bounding duty to not only serve othrs but to involve as many to serve with you if, we are to achieve better results, create an inpact and make a difference. Joy that is in my heart when serving others make me stick with my rotary club.